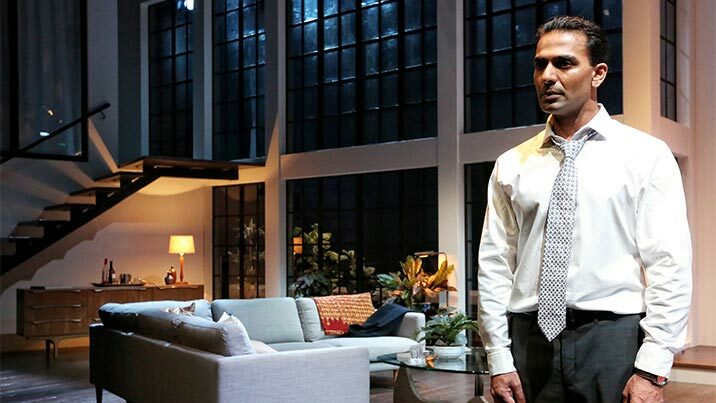 Sachin Joab makes his Sydney Theatre Company debut in Ayad Akhtar's Disgraced, playing high-flying New York lawyer Amir Kapoor. 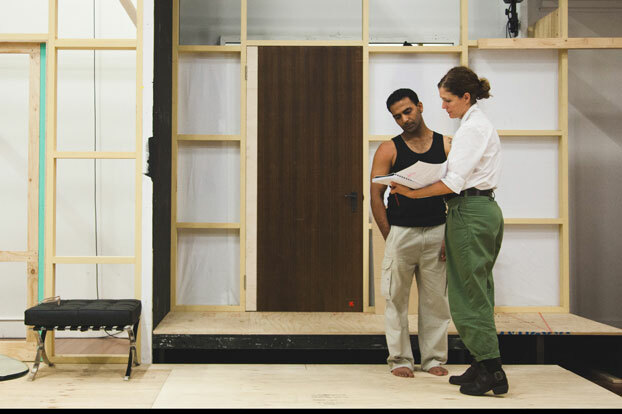 Having worked consistently in TV and film over several years, it's his first role in professional theatre, but he's shown the skill and assuredness of a seasoned veteran. Many Australians will recognise him from his two years on Neighbours, but our Content Manager Carl Nilsson-Polias sat down with Sachin to dig a little deeper. What was the first thing that drew you to acting? I loved watching movies as a kid. I grew up in the suburbs of Melbourne and there was a drive-in nearby – the Hoyts Clarinda. If I got up on our roof, I could see the screen. So, my best friend, who was a real brain, managed to tune in a little portable radio to the audio signal and we'd sit up there on the roof, freezing cold, wrapped in blankets and sleeping bags, watching movies – Crocodile Dundee, Rocky IV, all those 80s movies. That was the first time I took an interest in characters. Then, when I got to be about 12 or 13 years old, going into high school, I started to take an interest in the movies of actors like Robert De Niro and Al Pacino – Scarface, Raging Bull, Taxi Driver, Carlito's Way, even earlier ones like Serpico and Dog Day Afternoon. But it wasn't until I was about 15 that I started taking it more seriously, with acting classes and trying to get into student films at local universities like RMIT and VCA. I wanted to get that experience and build up a bit of a showreel. Did that experience help you? Well, one of the film students who'd directed me in a few short films, told me that if I ever went to New York, I should look up his aunt who worked at The Actors Studio. So, when I was about 24, I planned a trip to New York and his aunt invited me to the Studio. It was amazing. I got to sit in on seminars with Alec Baldwin, Pacino and saw a bunch of other Studio members who I knew from the sitcoms and dramas that I'd watched on TV growing up. I did a few classes there and at other studios in New York and then came back to Melbourne and graduated from the 3-year course at the National Theatre Drama School in St Kilda. 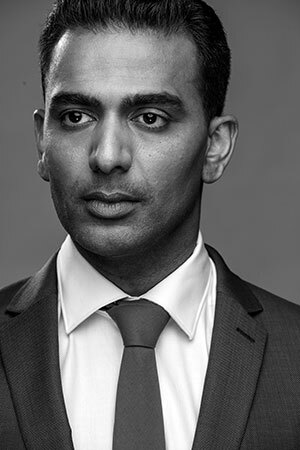 I started getting bits and pieces in film and TV here in Australia, but not a lot and most of it was stereotypical stuff – putting on an accent, either Indian or Arabic. So, I went back to the US. I didn't expect things to move quickly but I got an agent, manager and a job on a feature film all within three months of arriving in LA. I was also being auditioned for roles a lot more than I had been in Australia – the film and TV industry here is already small but, when you're not caucasian, it's even smaller. Instead of going for a role once a month, I was auditioning almost every day in LA, which was a great feeling. And it was always in an American accent, whereas in Australia I'd usually have to put on a foreign accent. It was actually while I was in LA that STC got in touch with my agent about auditioning for Disgraced. I hadn't done any stage work since leaving drama school, but I had done almost 250 episodes playing a lawyer on Neighbours, so I think that helped get me in the door. When I was back in Australia shooting the film Lion, I came to Sydney and auditioned. What was it that took you to New York? Had you been pursuing other things since leaving high school or was it something you just needed to save up for? My parents split when I was seven and my mum raised me completely on her own. I certainly didn't come from money. And, when you have a dream for your future that partially depends on money, you don't get your hopes up too much. You don't destroy the dream, but you bury it at the back of your mind. So, the idea of going to New York for The Actors Studio, which is where a lot of the actors I looked up to had gone, was always there but didn't seem within reach. Aside from the training, what really propelled me to New York was the way young Australians, particularly those from multicultural backgrounds, kept coming back from New York talking about how they got treated fairly there. In Australia, we hear from TV casting agents and network decision-makers that they can't wait for things to change, but they're the ones who can make that change happen. The power is in their hands. Especially when it comes to fictional work. You can understand when it's a nonfiction show that you need people whose ethnicities more or less match the people depicted. But when even fictitious work features only caucasian actors, when the country itself is so multicultural, there's a discord. Why can't stage and screen work be more representative of Australia as it is? Not just from a multicultural point of view, but also from a sexual orientation point of view. So, I kept hearing about New York from multicultural friends – Aussies born and raised in Australia, who always had to put on foreign accents here at home – and that really impelled me to go. When I got to New York it was a really fresh experience – it's such a full-on city – and I felt like another thing I'd been told about it is absolutely true – there's a kind of creative magic there. For musicians, for actors, dancers, songwriters, poets, photographers, painters, everybody. It was amazing. I got the attraction, I got the magic. I set myself up in this really tiny shoebox apartment on the border between Queens and the Bronx. I'd catch the subway into Manhattan and tried to soak up as much as I could. I didn't try to get an agent or get work or anything like that. I just wanted to experience it. And I loved it. I loved it. So I kept going back for long periods. I'd max out my holiday visa, cross the border into Canada for 24 hours and then go back. Did you pick up the accent easily? Yes, it's something that's always come quite easily. I was raised on so much American TV and film and trying to imitate their accents, whether it was East Coast or West Coast or Southern. Because I worked on it from such a young age, like anything, it was in my body. That served me a lot in New York. These days you're based more in LA, is that right? Yeah, I started pursuing work there more seriously about six or seven years ago. I'd hoped I could work in New York but the emphasis in the industry is really on TV right now and LA is where that work is. There's a common perception that the first generation born of migrants in a country like Australia are expected to make solid money – they become lawyers, doctors, engineers. The second generation might then get to pursue passions – as writers, actors, musicians. You've upended that notion and gone straight to the thing you love. Was that a controversial choice? Education is highly valued in South Asian culture, so yes, parents will often push for those kinds of professions and high academic status. But, with my mum, I never felt that. She wanted me to use the natural talents I had and I'd always done well in athletics and been attracted to the arts. She was supportive all the way. She would drive me cross-town to acting classes in peak hour, sleep in the car, then drive me back. She was dedicated 100%. She could see how much I loved it. In hindsight, I know that there were financial struggles, but she didn't show it. My dad drove trams for 30 years in Melbourne, my mum worked for Westpac. They both worked hard, long hours. My dad would stay at the depot after he'd finished to pick up spare shifts. I saw how hard they worked. All I really wanted was to work in something that I loved. I didn't do it expecting an extravagant lifestyle – I thought, as long as I'm doing what I love to do, I'll be happy. My mum came from a family of 10 siblings, from a village in Kerala, and she was the only girl in the family who got a university education, a degree in Economics. That was incredibly rare. She'd come to Australia to be with my dad but, after the divorce, all the family she had here was me, so we became very close. And when things were tough, I had to step up and be an adult, be responsible. But she still supported my choices. The only time I ever felt a hesitation on her part was that she knew before I did that it was going to be harder for me as a non-white actor. I was naive – I felt Australian, I sounded Australian, if you speak to me on the phone you wouldn't know that my skin wasn't white. But that was naive. My mum said to me once, "I think it'd be easier for you to be an astronaut than to be a multicultural actor in Australia." She could see how hard migrants before us had struggled, how long it had taken them to be accepted as Australian. Do you feel that Australia's attitude towards ethnicity has changed since you were growing up? In who's represented on our screens, not so much. In general, yes. When I went to school in Clayton I was one of a handful of Asian kids, when everyone else was from a European background. I mean, I grew up surrounded by Greek kids. The first word I learnt aside from English ones wasn't in Hindi or Malayalam, it was the Greek word μαύρο ('mavro'). That's what they'd all say, "Τι κάνεισ, μαύρο?" Now, if I drive past that school, I see kids from everywhere. I would be one of the crowd. I don't sense the undertone of racial bias that was there when I was a kid. But that's part of my frustration with the industry – it hasn't kept up with that change. You look at the main fictional dramas on Australian TV and they're still largely caucasian casts. Then you have SBS doing the exact opposite, so the networks almost look segregated. When you break it down like that, it's really sad that the mix of ethnicities that you can see in today's relationships and friendships isn't reflected. We're watching TV shows written about the past.